The opening episode, 25-year-old Yusaku (Nagase) was about to marry Yu, a famous manga artist to whom he was apprenticed. However, Yu had three children by a previous marriage, all of them resented her relationship with the much younger Yusaku and disapproved of the coming wedding. 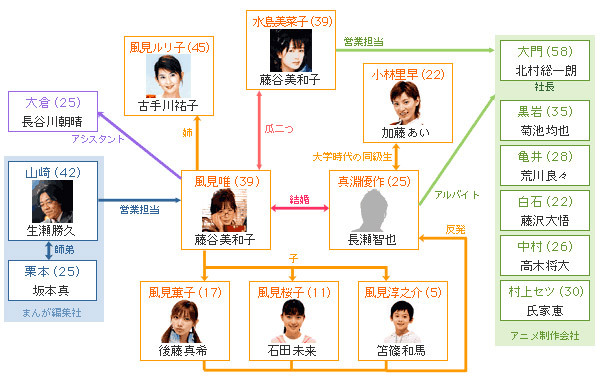 In fact, the three kids also disliked Yu, since she was always busy at work, they were raised by her older sister. This dorama had one hell of a lousy introduction. I hate how they approached the main plot. The barely was any chemestry between Yui and Yusaku nor did they look like they loved each other, all they did was eyeing eachother, and then suddenly Yusaku's character screams out on the street saying that he loves Yui and gets married in the first episode! The first three episodes were so daymn boring all it showed was a house with 3 spoiled brats that kept whining all the time! Though with this theme it could've been more touching but i guess some of the problems especially in the first episodes was skin-deep and a bit cliche. the youngest doesn't wann go to school, turns out they still have a no-good father. And the thing is, the problems that happens in this dorama, when the problems are childish, they get really childish you'll actually laugh when you're not supposed to, and when the problem is serious they get really serious. I guess it's a family dorama, nothing special, but it's definitely not below average and i think it was worth watching. It gets interesting and has a good progress starting from episode 4. It kind of reminded me of Mokodono in a way. But I think this drama is a lot better. Nagase Tomoya was a much better actor in this drama then he ever was in Mokodono it was less exagerated he just got on my nerves in the other drama. I thought he was a bad actor intill i saw this drama! The story is about a guy that gets married to this women and she dies the day after the get married. But he wants to honor his wife by staying with the 3 kids. it is a very touching story I love it it was so great. I must say I and in the mean time they learn to love him. (insted of hating his guts). I must say that I was wrong about Nagase Tomoya he can be a good actor if he wants to be! BUt I still think that Katou Ai is a very very very very very bad actress. I haven't seen any reason for me to change my mind about her. I thought this was going to be a bad drama it didnt look like much to me before I watched it. I decided to watch this drama because I liked the the combination of Tomoya and Katou Ai when they first paired up in IWGP. I was a bit disappointed with this drama because I thought they could have done a lot more with them two because they were so successful in IWGP for their chemistry. In other words, they didn't need to pair Katou Ai with Tomoya in this drama because there just wasn't really a love story or any real chemistry that made it so enjoyable in IWGP. I guess I thought they would use the same formula again (IWGP) but in another drama, like riding off the same successful formula. As for the drama, it's predictable, and not very creative. But, they didn't make it extremely cheesy and the standard for a drama was still there. But still, it's one of those dramas that gets you thinking how there are so many other things they could have done with it. Okay, I absolutely adore Nagase Tomoya, but this drama was just a drag. It took me SO LONG to get through it! The storyline was weak and therefore the plot simple slumped along. The entire story could have been communicated through half the amount of episodes the drama took. The cast was okay. No one really stood out and no one did a particularly bad job. Everything was just mediocre. Near the end the plot got interesting (with the introduction of the real father), but there wasn�ft much of a finale and by the end of it all, it was confirmed that, really, I had just wasted 10 hours of my life. Not that good, but if you don't expect too much it's watchable. Lighthearted and at times charming. Predictable of course and some things could really have been a bit more believable, too much even for a tv-drama sometimes. Guess the sensmoral is that blood sometimes isn't thicker than water. I have watched this when I was high school student about 10 years ago. Nothing special, just a simple dorama. Tomoya nagase played as a baby sitter here, he could handle many problems and could be like a father for the kids. The drama is not bad but I find Kato Ai's role in the drama annoying. She's very nosy and always meddles with other people's business. this is a great drama! it contains anime + drama!!! nagase sports a very interesting new look. he appears to have been working out something fierce. just look at his tai-chi skills in the drama, balance perfect, totally centred. he is quite handsome in this drama, and when he's not shouting, does some pretty nifty acting as yusaku :) interesting. the manga parts are effective in conveying yusaku's thoughts and intended actions, and in the process, add a supraordinary element to yusaku's efforts. very nicely done A++. the cute short ball of an anime which represents yusaku very gentle and sweet. biggest problem with the drama is its overly preachy tone. makes yusaku out to be godlike, all knowing, which just doesn't go down well in the least. the same for goto maki's annoying one-san; annoying because she always seems to be in the right place at the right time to observe yusaku's great deeds and to smile or look on with ever growing approval. urggh! finally, the mushy parts just about kill the drama off. what a disappointment. this one could have been much better. This drama started off a bit awkward for me, especially after just watching "Mukodono". The love interest in the first episode was a bit too eccentric and too childlike (even though she was old) for me to sympathize with her ordeal and the fact that Nagase Tomoya's character was in love with her. The drama later picked up and delved into Nagase Tomoya's father role. It was sweet and the way that the drama intertwined both the cartoon scenes and the real-life scenes made it even more heartwarming. Overall, this was a decent drama and it was different to see the Tomoya's softer side versus both his more animated side (in Mukodono) and his tough side (Ikebukuro West Gate Park and Tiger & Dragon). I would recommend this drama to Tomoya Nagase fans, but don't expect it to be similar to his other more popular dramas. all in all, i would recommend this drama. With no expectations, after a slow start in the first episode, I really enjoyed episode 1-4. Unfortunately, those were the best parts for me and watching the remaining episodes felt like a chore at times. It wasn't bad, but the story/situations seem a bit contrived at times. Goto Maki stole the show for me, I found myself watching the show for her scenes, wish there were more of them. Most of the other performances were all quite good actually. Unfortunately, Yuusaku's female friend gets on my nerves all the time!! Nagase is incredibly good looking here. But other than watching him and Goto Maki, this wasn't much fun to watch. The story's a bit too trite and old, altho it'll be nice to find a guy like Nagase's chara. And at least I'm not the only one that finds Kato Ai annoying...even the charas in the drama dislike her, lol. A little slow at first, but became so emotional and moving! Nagase Tomoya wa honto ni subarashii otoko desu yo. Everyone is great in the show. Although the ending is a bit unrealistic. And when are they ever going to make a drama about the reality of the American Dream all the Japanese day dream about. A lot of sad moments in this drama. Although there were few moments of happiness, the hope and love will become the greatest thing that shines the heart of a family that was broken apart. The story is compelling and will give an idea of how hard to bring family close together to know each other's hearts. A very sweet family dorama. Nagase played his role really good and it was the first time for me to see Maki Goto acting, but I really liked her. nagase-kun has done it again.. made me cry i mean.. i didn't expect it to be so good.. and the addition of anime in the show was really brilliant.. though the ending was expected, it didn't spoil the whole drama.. the kids did well.. esp sakurako.. goto maki was good too.. Although a little predictable (except for the ending! ), it is a highly enjoyable drama and definitely deserves the high score. Nagase Tomoya does a great job, as always, and the rest of the actors are surprisingly good as well. Good storyline that keeps you hooked! A very cute drama, did bring me to tears at least once. While a fairly cliche story in a way, it still had an interesting twist to it. The characters were well developed and endearing. Worth watching if you have the time, a nice family story! Predictable story about a young guy who becomes a substitute father of 3 kids. You know exactly what will happen & the ending's very weak. If there's a message for us to catch, I guess it's that blood sometimes isn't thicker than water. I love Yusaku. And in the end, I even like those two meddling girls who like him a bit too much. Who won't? I can understand why they're so into him. Heck, if I were in their place I'll be meddling too. Yorokonde. A pretty coo touching drama about a young man trying to raise his wife's kids after she dies after their marriage. Kinda of an uncommon situation. This drama has its funny and sad moments. I enjoyed watching it. The anime element is pretty unique to this drama, but the actual storyline is predictable and average. Tomoya Nagase and Goto Maki give the best performances. Kato Ai's character is quite annoying. So unbelievable, so boring, such bad acting... First ten minutes promised something but afterwards the story just went down. I couldn't even finish watching episode 1. One of the worst doramas ever. not very good... I was actually bored while watching it. After Mokudono I got curious about Nagase Tomoya. He is gorgeous in this series. Many touching moments but too bad his character did not have a lovelife by the time the series ended. One of the best roles from Tomoya Nagase!!!! Girls would certainly love to marry a guy like Yuusaku here: a very sensitive and understanding guy who gets up early every morning to do TAI CHI(! ), a devoted lover, a good (step)father who loves his (step)kids above all things and is *good at cooking*!!!! he2..i bought it cuz there is maki goto-- hu2.. actually this story is not quite bad...u guys out there have 2 watch this drama--pretty k!!.. Lovely dad, pushing so hard, so good cooking, it�Ls like an Onizuka more seriously taken as a father should be. A worth see it... really. Even if it was kind of cheesy, I thought it was interesting to watch. Nice warm and fuzzy family drama.